Higher Force Pump for Demanding Applications. The new KDS 410 is a high pressure syringe pump which more then doubles the linear force available on the KDS 200 series. This extra force makes the pump ideal for delivery of fluid to reactors in chemical applications or for working with viscous fluids. The robust design of the syringe holder ensures the syringe is kept level during delivery of the fluid. It features two different types of clamping mechanisms, for both smaller and larger syringes. When the application demands a more rugged pump, select the KDS 410. 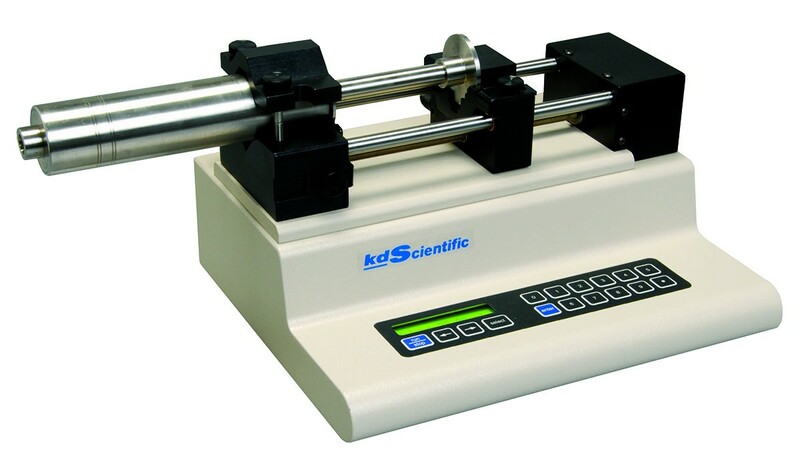 The KDS 410 features two modes of operation a dispense and a withdrawal mode. It is easy to set up and use in 2 quick steps; select the type of syringe and the flow rate. The selectable flow rate is entered directly into the program and stored in memory. A volume can also be set to dispense a known amount and then shut off. 1 µstep / 120 sec.